Please refer to our stock # ILC15 when inquiring. This smashing bracelet and earrings set was made by high end designer costume jeweler, Deanna Hamro. The bangle bracelet is 1/2" wide with a 2 1/2" diameter opening, and the matching clip earrings are 1 1/2" in diameter. 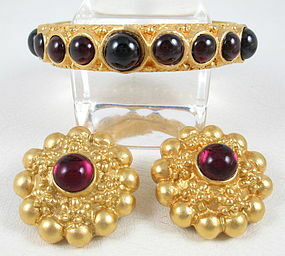 The set has a rich 24k Russian gilt finish, and all pieces are set with genuine garnet cabochon gemstones. Deanna typically works with rhinestones and poured glass, but I did have these checked out by a gemologist. Each piece is hallmarked "Deanna Hamro" and all are in excellent condition.